With Earth Day 2018 this Sunday, we caught up with VTA environmental planner, Lani Lee Ho. The former intern now full-time employee for the past nine years, shares what’s new in sustainability at VTA and a few tips for sustainable living. You started as an intern at VTA. Tell us about that experience and what you’re doing now. 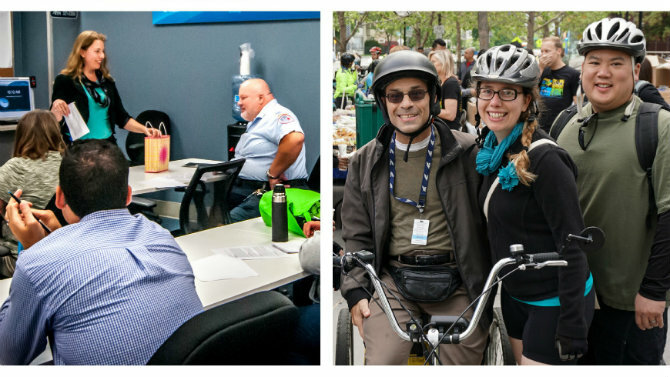 As an intern, I fell in love with VTA’s commitment to public service. I never thought I would be working in the transportation field, but it’s dynamic and fascinating. I like being part of the collaborative planning process and seeing capital projects take shape. Currently, as an Environmental Planner, I am responsible for the state and federal environmental clearance of projects. This exposure to environmental and land use law led me to pursue law school. When I look back on my career at VTA, I feel honored and grateful to the leaders and mentors who invested in me. Now, I’m trying to do my part to pay it forward and be a mentor to VTA’s new generation of leaders. VTA’s Sustainability Program is celebrating 10 years. Can you share a few accomplishments? Sharing a decade of accomplishments is a little hard to do, but our team has captured most of them in an interactive Story Map on our Sustainability Program page. In addition to installing solar at all three bus divisions and achieving APTA Gold Level Sustainability Recognition, I think the small actions deserve attention too. For example, in the past year VTA made many changes to reduce waste and improve efficiency such as using digital signatures, converting paper forms to electronic, sharing unwanted or surplus office supplies through the River Oaks Reuse Center, adding composting to break areas and restrooms, and adopting an Environmental Preferable Procurement Policy. We are also taking steps to green our fleet by procuring battery-electric buses and electric vehicles for the non-revenue fleet. What are you most proud of at VTA? I was part of the Eastridge Transit Center Project from the initial planning phase to the end of construction. It was fun to see this project come to life and overcome challenges along the way. I am proud of the sustainability design features that were incorporated into the project. Pervious pavers were used in place of traditional materials, to allow water to infiltrate the soils beneath, rather than running into the nearest storm drain. The transit center also includes bicycle parking, electric vehicle charging stations, LED lighting, and drought-tolerant landscaping. Another proud moment for me was attending the 2012 groundbreaking of VTA’s BART Silicon Valley Extension Project. I remember being present as our elected officials shoveled ballast on the future track area to symbolize the start of construction for the 10-mile extension. Over the years, I assisted with the preparation of addendums and other environmental documents for the project. It has taken a whole village to get to where we are now. I know opening day will be another proud moment. As we move into the design process for Phase II, I look forward to working with the project team to incorporate green building features to lower costs and conserve resources. What motivates you to ride public transit daily? No one wants to be stuck in commute traffic, so I let VTA do most of the driving. This allows me to kick-back and catch up on social media or email. Most of us know that riding transit reduces fuel consumption and lowers greenhouse gas emissions related to climate change. But there are also less obvious, yet important environmental and health benefits. For starters, public transit can help promote an active lifestyle. People who use public transportation are four times more likely to walk 10,000 steps a day than car commuters. Also, transit can reduce greenhouse gas emissions by supporting higher density. More compact development conserves land and reduces the distance and time people need to travel to reach their destinations, thereby reducing vehicle emissions. Residents living in close proximity to congested roadways face higher health risks due to poor air quality. Public transit improves air quality by moving more people with fewer vehicles, thus producing fewer vehicle emissions and pollutants that create smog. What’s your favorite life hack for living more sustainably? I actually have two. Get a bucket for the shower. This little trick makes it super easy to save water. I keep a 5-gallon bucket in the shower to capture water while it’s heating up. Then, I take the bucket outside to water any plants in pots that are not connected to our drip system. Another favorite is using reusable dishware at work. I even carry my own dish to staff celebrations or events. Sometimes it’s a fun conversation starter...like “Hey, that’s a cool mug. Where did you get it?” I’ve never been much of a trend-setter, but I would be absolutely okay if the BYO trend catches on!